I found this vintage article entitled It is from a 1970’s edition of The Workbasket . I have time to time used many old remedies and techniques to attend beauty, cooking, household, and yard care. I have found many to be quite useful but many ingredients are no longer available to the public or are outlawed. 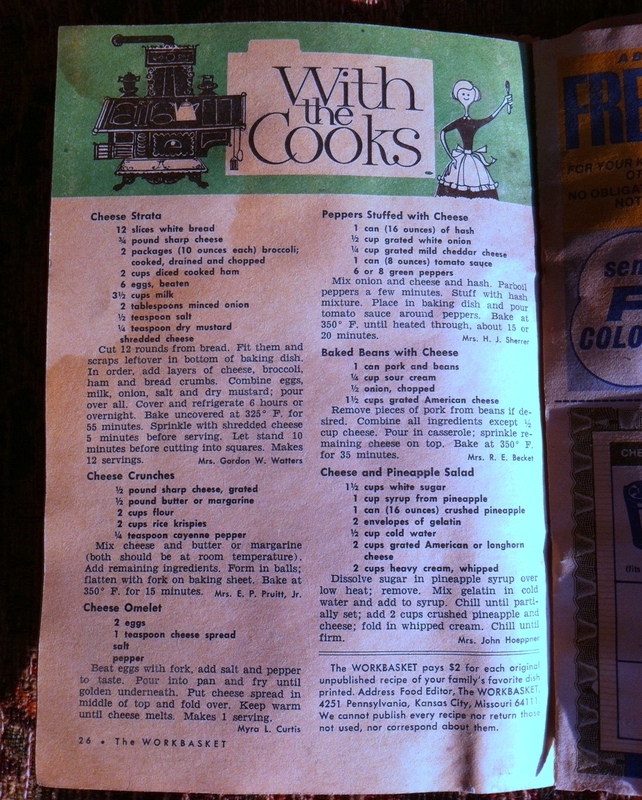 From what I saw the ingredients for these recipes are still quite available today. I cannot remember following an old recipe where the outcome was not “good enough” to eat. I haven’t, myself, tried any of these yet but intend to try the Cheese Crunchers first. I will report what I learn, any problems, and how it tastes. Any of you out there who try one of these recipes, I would really like to hear from you about your experience. I love to cook and sharing such information is so much fun; the exchanging and changing of recipes, settings, etc.